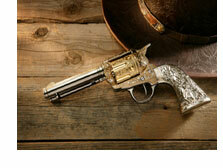 Famous western movie lines and western movie quotes. Well, I'll reckon famous western movie lines can be infamous. Cuz' here you'll find some plum mean villains saying some of the maddest darn things. Some others is simple folks with hearts o' gold. A maverick hero during the wild west was usually a lawman, a cowboy, territory marshal, military officer, or just a gunfighter. Tough, independent, fearless. Characters of honor and principle. Willing to face any danger in a hostile environment all alone.